Much to the chagrin of ranchers and agribusiness, one of Rio de Janeiro’s popular samba schools, Imperatriz Leopoldinense, is making visible the terrible consequences of agribusiness and hydropower dams on the Xingu Indigenous Park in this year’s Carnival. 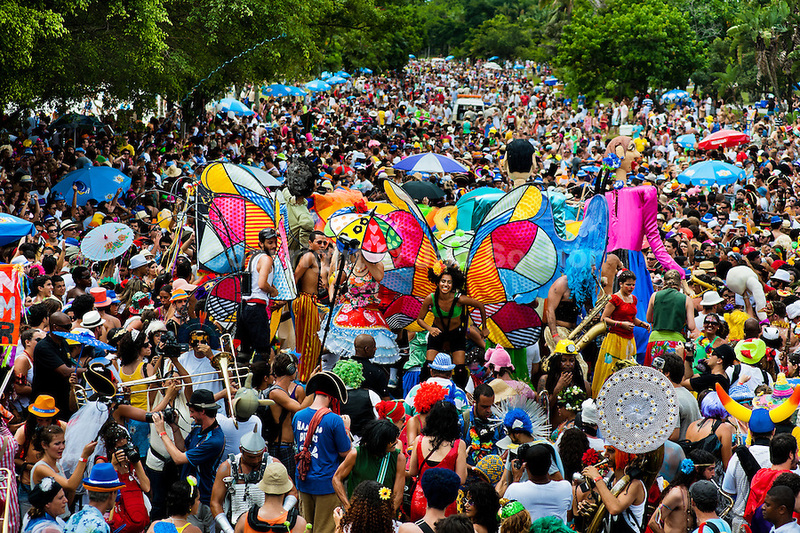 Carnival street party in Rio de Janeiro, Brazil. Image credit: Jan Sochor. It’s the biggest party on earth. The greatest multitude of happy people having fun, dancing samba in the streets. But there is also provocation, by inverting positions and making the powerful and the elite ridiculous through irony and sarcasm. Carnival can be serious without losing a smile. This year we are all Indians against ranchers and their pesticides, in support of the samba school Imperatriz Leopoldinense in Rio de Janeiro! Carnival is a festive form of protest, it is a powerful way to express discontent in a very colourful way. It is the moment to invert the order, to subvert power positions, as poor people dance and make music on the street dressed like emperors and empresses. Some might take this opportunity to mock their own subaltern position while at the same time criticising the powerful, showing that they are aware of their situation in a world of inequality, as writes John Dawsey in the Theater of “bóias-frias”. In Brazil we know how to celebrate Carnival like few countries in the world. And we know how to mock the powerful. 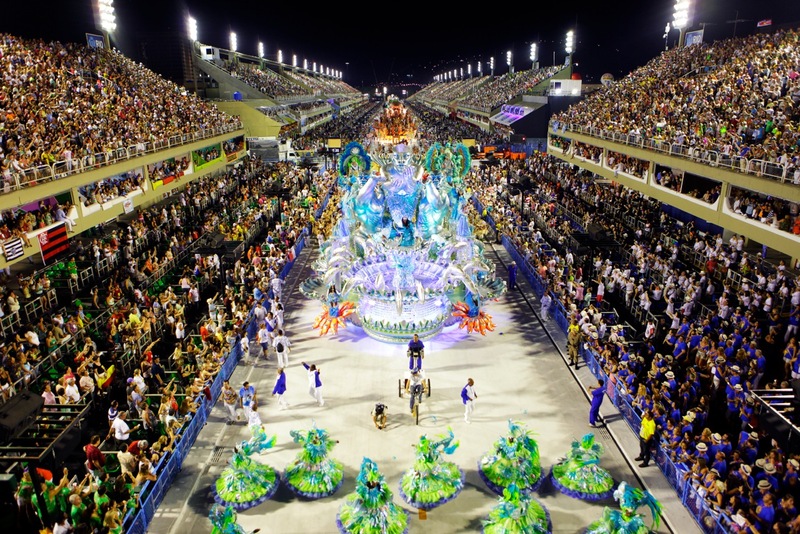 Carnival in Brazil has become big business, with millions in investments and major negotiations over TV broadcasting rights, an event as profitable as a football championship. In Rio, each 90-minute parade of the 12 first division samba schools appears in its entirety on TV screens, with huge audiences watching nation-wide and internationally. A slip, a beautiful smile of a new face, a decaying celebrity’s new round of plastic surgery: everything can gather a huge amount of attention and become hype within minutes. As the political unrest in the country grows, following former President Dilma Rousseff’s impeachment and the rise to power of her fomer vice president, Michel Temer, upon a coup that took place last August, many people expect this Carnival to be unforgettable. As a popular saying goes: the bigger the political mess or the economic crisis, the greater will be the Carnival! Indeed, the terrible political moment Brazil is currently facing is a prolific time for Carnival. Rio’s Sambódromo Sapucaí. Source: google.com. Sapucaí, the beautiful sambódromo avenue with bleachers created by the renowned anthropologist Darcy Ribeiro and designed by the modernist architect Oscar Niemeyer is the scenario where wonderful dresses, allegoric cars in detailed decor, powerful percussionists with drums, cuica players, singers, women, men and trans, open the stage with their majesty. “Imperatriz Leopoldinense wants to bring awareness to the terrible consequences of the monoculture and pesticide-based agribusiness and the impact of hydropower dams on the Xingu Indigenous Park”. The Xingu Indigenous Park was created in 1961 by the indigenist Villas-Bôas brothers,the medical doctor Noel Nutels, and anthropologists Darcy Ribeiro and Eduardo Galvão, mythological figures in Brazilian history, in order to protect the geographic and cultural territory of different indigenous populations. Located in the upper Xingu, on the southern border of the Amazon, with 2.5 million hectares the park is home to 16 different indigenous nations. While some of the designed costumes celebrate natural and cultural aspects of Xingu culture (Indian masks, the forest guardian, fish, Guariba monkeys, the armadillo, the Pequi fruit festival), others depict the negative influences on indigenous peoples and their environment: pests and diseases, the arrival of the invaders, the eyes of greed. The most controversial costume represents a rancher with a cowboy hat and a corn dress spraying pesticide. 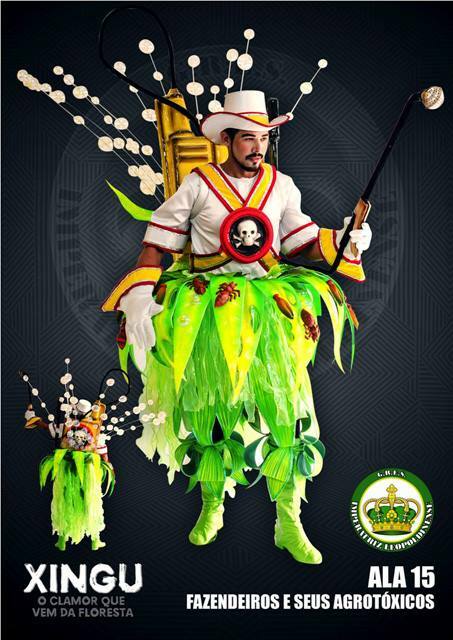 One of Imperatriz’s costumes depicting a rancher spraying pesticides. Source: www.imperatrizleopoldinense.com.br. The big ranchers didn’t like it. Since they take Carnival seriously, to them Imperatriz’s samba theme is a threat. The national agribusiness federation reacted immediately after the theme was announced in early January. As several agribusiness people occupy important political posts, the Senate proposed censorship. The proposal was spearheaded by Ronaldo Caiado, a famous rancher and founder of the violent União Democrática Ruralista (UDR), the ranchers’ association responsible for killing Chico Mendes in 1988. He publicly threatened Imperatriz, and tried to initiate a Senate investigation on the sources of Imperatriz’s carnival donations and investments. Both Cahê Rodrigues and Imperatriz, under pressure, gave public interviews informing that their intention was not to offend ranchers, but to defend Indians and the forest and their “cry from the forest”. 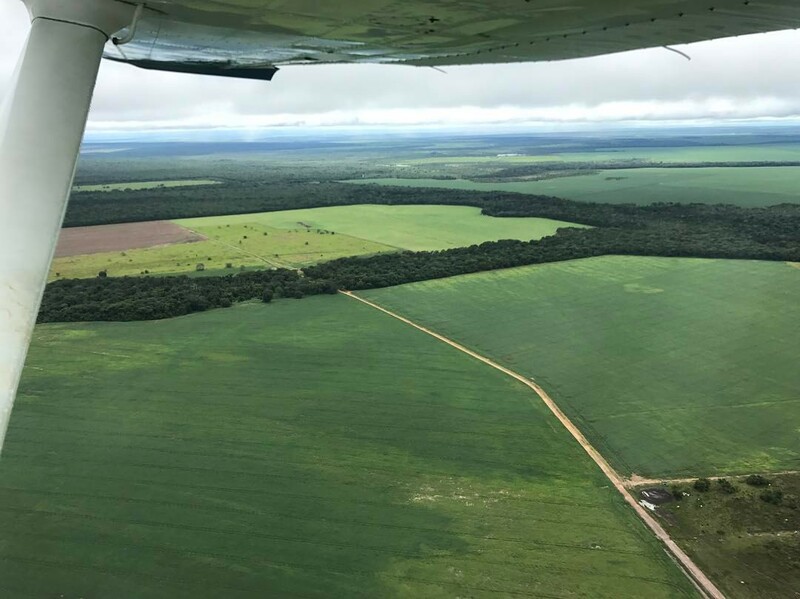 Cattle ranching alone is responsible for 80% of the deforestation in the Amazon, and the Xingu Indigenous Park is now completely surrounded by a vast expanse of monoculture soybean plantations. The forest has become an island, and the clear rivers, which run through the upper Xingu, are now muddy and polluted by pesticides. Even though reality is much worse than what the samba songs and the costumes of dancers can show, the agribusiness sector accused Imperatriz Leopoldinense of insulting their activities, claiming that the country is fed thanks to agribusiness. The latifundiarios are the big land grabbers in the colonial history of Brazil. They are also known as the owners and inhabitants of the “casa grande” (the big house), referring to the elite families who got rich with sugar cane plantations in times of slavery. Today they are investing millions in a media campaign in the Brazilian television network Globo TV, which promotes their popularity: “agro is pop” and “agro is tech”. Apart from exposing the poisonous and genocidal role of the ranchers, Imperatriz also criticises, as does every environmentalist and human rights worker in the Xingu basin, the Belo Monte megadam. Named “belo monstro” (beautiful monster) in Imperatriz’s lyrics, the dam was constructed during Dilma’s government, when Brazilian agribusinesses and extractive industries had accelerated their expansion, with access to massive funds from the Brazilian Development Bank BNDES. Dilma’s neo-developmentalism also depended on big mega infrastructure projects, such as hydropower dams on Amazonian rivers. 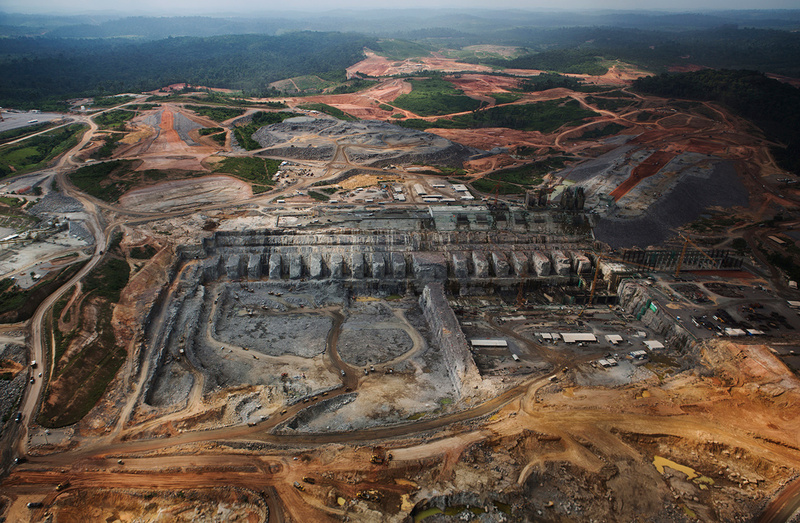 The Xingu river may soon be affected by another environmental disaster, as a Canadian mining company Belo Sun Mining just obtained the license to extract gold in the vicinity of the Belo Monte dam. Once again, predatory extractivism, toxic waste and the destruction of nature will be the only heritage left to the people of the Xingu. The Belo Monte Dam during construction (above) and after flooding of the reservoir (below). 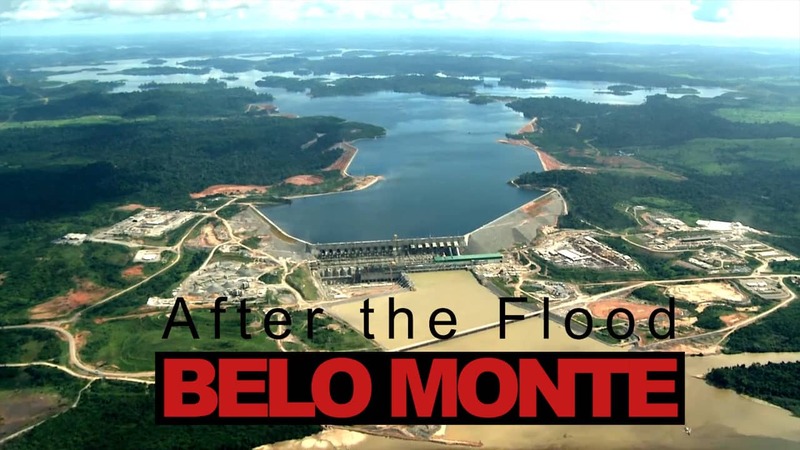 Image credit: Lalo de Almeida / Todd Southgate’s film ‘Belo Monte: After the Flood’ (trailer). Raoni, the Kayapo leader whom many remember from his world tour with rock star Sting to fundraise resources to protect the Kayapó land, is now an octogenarian and lives by the Xingu River. He is expected to be parading with Imperatriz in Rio to bring his power to the samba. Indeed, neo-developmentalism in Brazil today is threatening even indigenous peoples who still live in voluntary isolation, as the authors of this post argue in a forthcoming article. Indeed, as Arisi and Milanez have written elsewhere, neo-developmentalism in Brazil today is threatening even indigenous peoples who still live in voluntary isolation (see their forthcoming article Isolados e ilhados: indigenismo e conflitos no Vale do Javari, Amazônia, to be published soon in Estudos Ibero-Americanos, Vol. 43, n.1). Responding to the polemics around the samba lyrics, Cahê Rodrigues said, it just “exposed the enormous prejudice and racism against Indians and against the school.” An outraged journalist from Record TV answered that Indians should deny all modern technology, not have access to medicine and they should indeed die of malaria. Her message had fueled the debate about prejudice and violence against indigenous people living in the Brazilian territory. 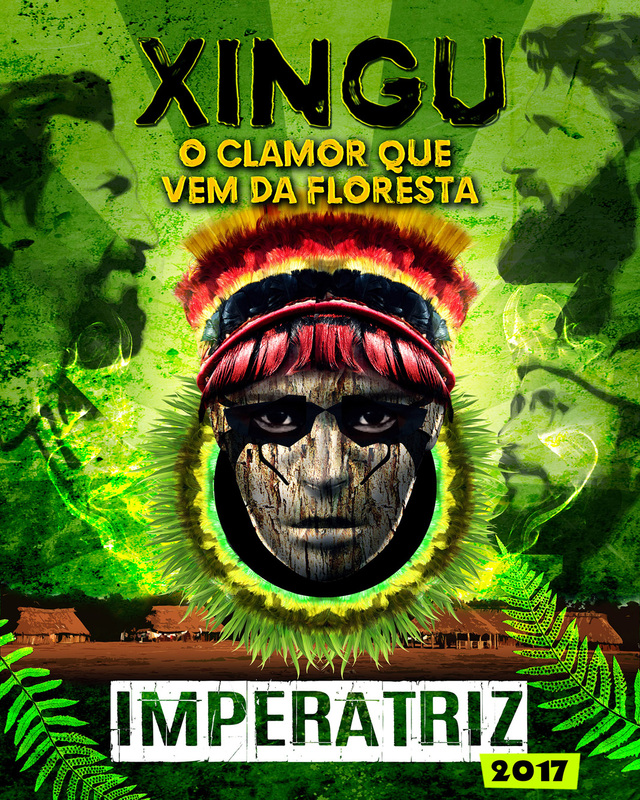 Using social networks with internet radio connection from their villages, the Xinguanos came out in support of Imperatriz with several posts and images. The indigenous filmmaker Kamikia Trumai Sudja also posted a film he recorded with the indigenous leaders Kamani Trumai and Ngaisoktxi Suyá. As Kamani says, Indians fight for the forest and now, with the Carnival, the entire world will know. “This is the truth, this is what they are doing to us”, affirms Ngaisoktxi. 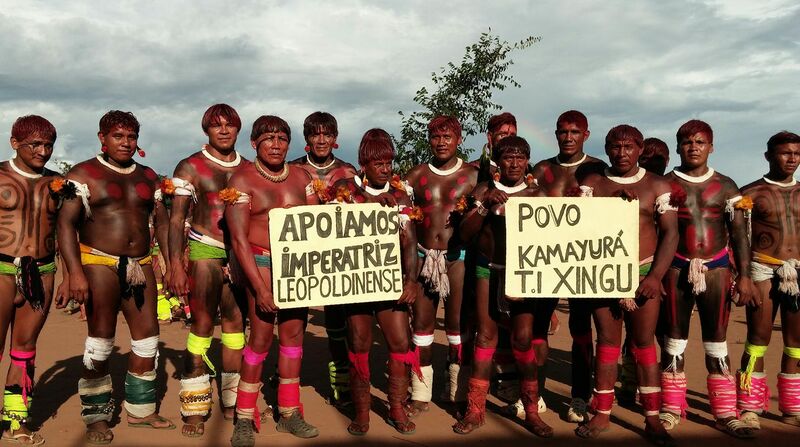 Kamaiura Indians standing in support of Imperatriz Leopoldinense. Image credit: Marcello Kaminatah. Takuma Kuikuro, another film maker, revealed that ranchers were offering R$ 15 million (around € 4,4 million) in bribes to Indians if they refuse to go to Rio and to support Imperatriz. He also posted aerial footage he took when flying back home to his beautiful village Ipatse. The image shows the vast monocultures of soybeans and the deforestation and destruction that surround Xingu. Soybean monoculture plantations surrounding the Xingu indigenous Park. Image credit: Takuma Kuikuro. As the samba lyrics of Imperatriz, Takuma and Kamikia cry out for the “clamor that came from the forest.” Yes, this year, we should have a great and unforgettable Carnival. Let’s hope the performance can move ordinary people to support the indigenous struggle to keep the rivers and the forests clean and alive for future generations. Ziriguidum. Ziriguidum. *Barbara Arisi is a Professor at the Universidade Federal da Integração Latino-Americana (Unila) and currently a visiting fellow at the Vrije Universiteit Amsterdam, as well as a member of the Brazilian Association of Anthropology. Felipe Milanez is Professor of the Decolonization of Knowledge, Society and Environment at the Universidade Federal do Recôncavo da Bahia (UFRB), and a member of the ENTITLE collective.